Koffler has what you need to install your carpet padding - try our solvent free Carpet Pad Adhesive or one of our great Duct Tape options. 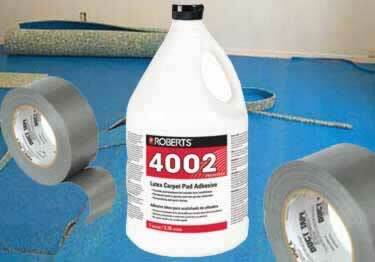 The 4002 Solvent Free Carpet Pad Adhesive is a water-based adhesive created specifically for easy, safe, permanent installation of rebounded foam, synthetic foam, and rubber carpet padding. It is designed for padding installations over plywood of underlayment quality, terrazzo, marble, sound-resilient floors, which are free of wax and embossing, and on-, above- and below grade concrete subfloors. Another option to for padding installation is to use one of our two tapes. The 2" Silver Duct Tape is a vinyl, fabric reinforced, soft and tacky pressure sensitive adhesive tape that is great for padding installation as well as general-purpose applications. The 2" Recycled Duct Tape is a very economical duct tape that is perfect for carpet padding installations.